Do you want to get prepared for your first kayaking adventure? 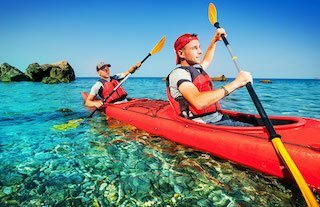 You will need to read some tips about kayaking in order to avoid any unpleasant consequences. As a leisure experience, at this level of training you will compare such a kayak adventure with a more difficult route on the mountain, where you have to be so attentive to the trail (or to a lot of things related to the boat) that you do not have time to think about something else, you have to stop thinking about yourself because you are in a "survival" situation. On the other hand, the feeling of kayaking is a pleasant and complete one, you work all the muscles of your body, and even the legs if you are tense and you pass the equilibrium effort to your feet! 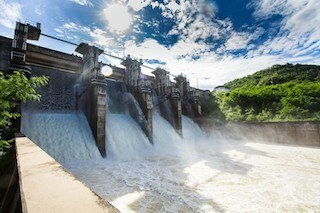 In the vicinity of the dams, the stables and the bridge legs, there may appear to be "harmless" portions of water. It is advisable not to try to enter these upstream or downstream areas, as they may pose a potential risk of overturning. Do not approach drainage channels, gates or locks; the current can pull you without being able to react efficiently. On rivers, it is preferable to choose the inside of the curves; the speed is higher on the outside, but there is the likelihood that water will bring trees and trunks of trees that get tangled and dangerous. Be careful not to get caught in them. Click here to find great river kayaks! On open water surfaces, the waves can "rise" rapidly in the event of increased wind intensity and in the event of storms. We recommend that you keep away from motor boats or boats. Do not falter on rivers during torrential rains or floods! More potential dangers are covered here. See weather forecast ahead of "outbound"
Adapt your weather and program function. In any situation, no matter whether you are on the water or on the shore, give assistance to people in difficulty! When you are on the water, make sure you do not disturb the fishermen or damage their fishing gear. Try to move as quietly as possible. If you arrive in areas where water sports competitions take place, do not enter the competition lanes and try not to disturb the athletes. Carefully choose your language when you are in the presence or proximity of strangers. Pre-inform the local rules on the waters that you are going on a kayak adventure. Respect nature! Do not dispose of waste and rubbish in water or in nature! Keep them until you can throw them in a set up space. Observe the vegetation on the banks and the water. Enter into reservations only with the prior approval of the authorities. Do not disturb nests of birds and animals that live near water. Some tips cannot replace the recommendations of a professional instructor. 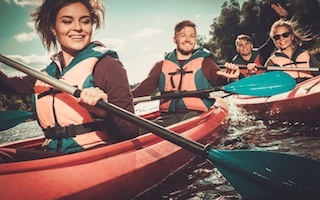 If it’s your first time going kayaking, ask a person with more experience to accompany you. At the edge of the river lay the boat parallel to the shore, facing upstream. Place the paddle perpendicular to the boat in front of the carling. Place both hands on the paddle (one on the boat, the other on the bank) and then climb up the boat (first leg and then second) and sit in the chair. Place your cover (if necessary). At the exit, repeat the movement, the boat being upstream (face to face). When leaving at sea or ocean, place your boat perpendicular to the shore (beach) facing towards the water, the front of the boat being on the water. To get out of the boat after returning from the water, make the same move with the only difference that the boat will be facing the shore. This article covers the best brands of kayaks for different types of functionality. If you encounter difficulties ask your partner (or a person nearby) to keep your boat in place. Sit comfortably and adjust your back to give you the position you want. If you go out on the water with a kayak, stretch your legs, find the footrest and then test the balance by making waves moving the boat. Inflatable kayaks would be easier to adjust to. In the kayak: both hands hold on the paddle at equal balls and at the gap between hands equal to the opening of the shoulders. The right hand is held on the paddle, the bar moving in the left hand (in the left-handed persons may be the other way around). On the canoe: one hand will catch the page bar near the pile, the other will be placed at the end of the bar on the handle (the perpendicular side of the page bar). The hand on the handle allows you to change the orientation of the page in the water to give direction to the boat. For traveling with the canoe and keeping the direction, we recommend that you request a demonstration from an experienced person. In the double kayak, watch your partner and at the same time linger and the same rhythm with him. When you travel with the two-person canoe, choose each part to be paddled; if you get tired, do not hesitate to change the part from time to time. Look ahead and keep the boat straight towards the direction you want to reach. Make wide paddle movements; it is more efficient if you constantly and rarely get rid of it, to improve your movement. Stop from the paddle and reduce the speed or brakes by moving backwards towards the front (vice versa then the movement that will make you move forward), the alternative on each side of the kayak. We hope you find our guide useful. Make sure you follow our tips mentioned above and you are good and ready to go. Remember to share this guide to any of your peers who are also interested for a good fun kayaking adventure.